It has been a test of patience for Drew Nesbitt at the PGA Latinoamerica Tour’s Molino Canuelas Championship in Buenos Aeries Argentina, but one that has paid off thus far for Nesbitt. It has been what Nesbitt described as a “miserable couple of days for golf”, due to the rain that has pounded Buenos Aeries, Argentina. This bad weather has resulted in the tournament being shortened to a 54 hole event This has left many to finish their second round on Sunday morning, before the third and final round starts. Nesbitt is currently one shot behind the leader Benjamin Alvarado after posting a bogey-free six under 66 in the second round. Nesbitt also stated that the bent greens this week are similar to those back home, and combining that with his trust in his lines this week, he has had some strong play through two rounds. El canadiense @DrewNezbitt suma su sexto birdie de la R2 del #CañuelasChamp en el 17. Con 9-bajo par se suma a Sanders y Alvarado en liderato. Going into tomorrow Nesbitt believes he may have a slight advantage over those who have to finish their second round, but also believes he has to keep focused andplaying his game.” Tomorrow I have to do what I have been doing, golf is golf,” Nesbitt said. Nesbitt furthered this when asked what part of his game will be the most important to close out the tournament tomorrow. “It comes down to controlling the emotions and making the putts at the right time,” he said. Nesbitt has conditional status on the PGA Latinoamerica tour but hopes with strong performances he can gain better status in the reshuffle. He plans to continue to play on the Latinoamerica Tour until it goes on break in June. After that, Nesbitt plans to try and Monday qualify for Mackenzie Tour events as he did not go to one of the qualifying events. Nesbitt then plans to continue to play on the Latinoamerica tour when it picks back up play in August. Nesbitt’s tee time is not yet set for tomorrows third and final round, but will most likely be around noon after everyone else finishes up their second round. It will be a damp start to the morning tomorrow, as it is supposed to rain throughout the night. However, it does looks clear for the tournament to finish up tomorrow. Austin Connelly is two shots behind leader Alvaro Quiros going to the final round in Morocco at the Trophee Hassan II. Connelly started the week with a 69 before firing back to back 71’s, putting him tied for sixth going into the final round at Royal Golf Dar Es Salam. His best finish this season on the European Tour came in February in Malaysia at the Maybank Championship, where he finished tied for 62nd. Connelly is a dual citizen of Canada and the United States. He was raised in Irving Texas but spent summers in Nova Scotia where his grandparents live. Connelly’s dad was born in Toronto. 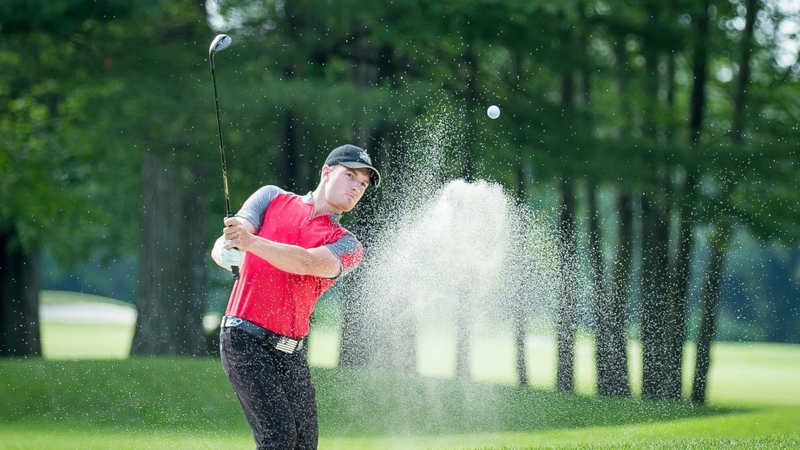 Throughout his amateur career, Connelly flipped back in forth between representing the United States and Canada, maintaining the idea that he would represent whatever country furthered his game the most. In last years Open Championship at Royal Birkdale, Connelly finished tied for 14th, with a pair of rounds in the 60’s. Tomorrow morning Connelly tees off at 6:55 am eastern time and is paired with Joost Luiten and Alexander Bjork. David Hearn had five birdies en route to a four under 68 today at TPC San Antonio putting him tied for fifth going into the weekend, combining his 68 with a 70 on Thursday. Hearn’s strong play can be credited to his work on the greens, as he leads the field this week in strokes gained-putting. Putting has been an issue for Hearn after the ban on anchoring putters, as Hearn was a player that relied heavily on anchoring his putter for his prior success on the greens. Hearn credited his success after today’s round to his former putter that he would normally anchor, that he has since shaved down. Tomorrow’s round will be telling for Hearn, who ranks 204th on tour in average putts in the third round. Hearn’s best finish on tour this season came in November at The RSM Classic, where he finished tied for 17th. He does not have full status this season because he finished 128th in the Fedex Cup standings last season. Hearn tees off tomorrow at 12:05 ET with Chris Kirk and Billy Horschel. Canadians Corey Conners and Ben Silverman also made the cut are both tied for 48th. Six Canadians will be competing this week when the Web.Com Tour stops in Oxford Mississippi for the North Mississippi Classic. This will be the first edition of the North Mississippi Classic and the first time a PGA sanctioned event has taken place in Oxford. Adam Svensson comes into the week as the most favored Canadian, ranking third on the money list, two top 10’s and a win this season. Rookie Stuart MacDonald looks to build off his second round 64 in the Savannah Golf Championship a couple weeks ago, giving him the course record. Ryan Yip is in the field this week after withdrawing from the Savannah Golf Championship. Yip currently sits at 33rd on the Web.Com Tour money list. Roger Sloan looks to continue his strong play and find his way into the top 25 of the money list, as he currently sits in 30th, and his coming off a pair of 68’s in the last Web.com Tour event. Also in the field this week are Canadians Seann Harlingten and Albin Choi both of who are looking for their first top 10 of the season. Albertan Steven Lecuyer is competing in the Zanaco Masters in Zambia this week, in what will be his first Sunshine Tour event. Lecuyer received his Sunshine Tour card after advancing through qualifying school. Lecuyer brought up his excitement for the week and the season, stating, “I feel very excited about my first season on the Sunshine tour, the players and venues are world class. This will be a great experience and I look forward to starting the season this week in Zambia,” he said. This weeks event is taking place at the Lusaka Golf Club. Lecuyer described it as a tight driving course with small greens, which makes for a good challenge. Lecuyer also described how he feels his game will match up against the course. “My game suits this course well, I’m hitting it well off the tee and hitting my short irons solid as well,” he said. An interesting aspect of this weeks tournament are the greens, as the Sunshine Tour went as far as to admittedly call them patchy. Lecuyer agreed, saying they are grainy with not much break, but he also said that if he hits it solid with pace, there will be no problem in sinking putts this week! When asked what he would like to change from qualifying school, Lecuyer said he’d like to stay more present in his routine this week, which is something that he has been trying to change since qualifying school. Update: Steven Lecuyer shot a 2 over round of 74, placing him in a tie for 76th after the round one. The Lotte Championship kicks off Wednesday April 11th at the magnificent Ko Olina Golf Club on the beautiful island of Oahu in Hawaii. The stacked field includes 14 of the top 20 women in the world as well as a slough of former champions of the event. Canadians in the field include: Alena Sharp, Brooke Henderson, Brittany Marchand, Anne-Catherine Tanguay, Maude- Aimme Leblanc. Maude- Aimme Leblance has made the cut in all three events she has played and looks to improve upon her T39 finish at the Kia Classic. Meanwhile, Anne- Catherine Tanguay looks to make her first cut of the season, as does Orangeville, Ontario’s Brittany Marchand in her debut even of the 2018 season! Sharp and Henderson are playing in two of the marquee groups. Sharp is teeing it up at 8:17 local time with former US Womens Open Champion, Na Yeon Choi and rookie phenom Emma Talley. Meanwhile, Brooke Henderson tees off at 12:50 with Bronte Law and former world number one and seven time major champion, Inbee Park. Alena Sharp bounced back after a couple of missed cuts and last week at the seasons first major, the Ana Inspiration finished T38. Sharp looks to build off that finish this week at a tournament where she finished tied for fifth a season ago. Henderson has had an up and down season thus far and after a disappointing T48 finish at the seasons first major she looks to get herself back into contention this week on the beautiful island of Oahu! The event kicks off a day earlier than normal and concludes on Saturday April 14th in an effort to accommodate for Korean television networks. In the wake of the Humboldt Bronco’s bus crash that killed 15 people and injured 14 others on Friday April 6, people from all over the world have rallied together and donated money to help the healing process. Thus far over 8 million dollars has been raised to help the families impacted by this tragedy and Canadians have shown their support through placing hockey sticks outside their front doors! Considering this, Canadian professional golfers are also doing their part to help out those affected in the aftermath of this tragedy. PGA Tour pro and British Columbia native, Nick Taylor tweeted earlier in the week that he would be donating 500 dollars for every birdie and 1000 dollars for every eagle at this weeks RBC Heritage at Harbour Town Golf Links in Hilton Head, South Carolina! Also, Mackenzie Tour hopeful and Saskatoon native Liam Courtney will be donating 15 dollars for every birdie, when he tees it up at Mackenzie Tour Qualifying School in three weeks time at The Club at Eaglebrooke in Lakeland, Florida. Courtney’s contribution will also be matched by his home course, Waskesiu Golf Course in Waskesiu, Saskatchewan. As they pledged to donate 20 dollars for every birdie that he makes. Courtney graduated from Regis Universty in Denver, Colorado last spring and hopes to earn full status on the Mackenzie Tour for the 2018 season.